the ways to announce your pregnancy should also be filled with fun and creativity. Here are few fun ways to tell your friends and family about this great news. 1. Announce it with a balloon: Take a large balloon and write, “about to pop” on it. Hold the balloon above your belly and take pictures and announce what’s hidden inside. 2. Grocery list: If your husband is still unaware of this big news, make a grocery list saying baby peas, baby carrots, baby spinach and baby corn. Allow him to guess for a while and discover the most amazing smile on his face. 3. 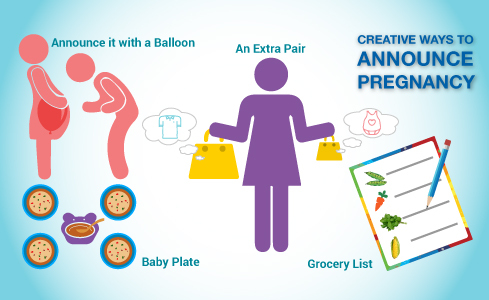 Baby plate: Announcing to the entire family at the same time will be most convenient at the dining table. After serving to all, serve mashed food on a baby plate and place it at the centre of the table. And see the thrill and joy coming on the faces of grandma and pa.
4. An extra pair: Announcing the news to the kid in the house could be trickier as they may immediately get a sense of insecurity. Take your kid to shopping and ask them to buy an extra pair of whatever they buy in a baby size. Resolve the queries on their faces by announcing the news to them and making them believe how much fun they will have together.